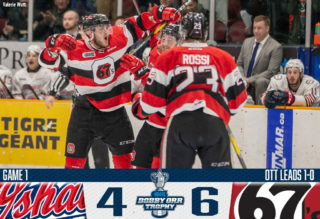 Tye Felhaber broke open a 3-3 tie, scoring three consecutive third period goals for a natural hat-trick to give the Ottawa 67’s a 6-3 win over visiting North Bay. 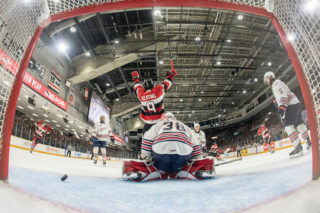 Felhaber’s 27th, 28th and 29th goals of the season put him into the OHL goal-scoring lead as the 67’s recorded at least a point in their 23rd straight game. The hat-trick is Felhaber’s first of the season, giving him goals in six of the past seven games. The 20-year-old from Pembroke, Ont. has 46 points (29-17–46) over 29 games this season. 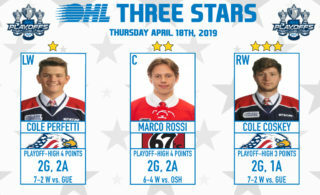 Overage winger Keeghan Howdeshell netted the second of back-to-back hat-tricks in the state of Michigan this past weekend, helping the Soo Greyhounds defeat the Flint Firebirds 5-3. Howdeshell scored 33 seconds into the second period before adding the game’s winning goal with 32 seconds remaining in the frame. He hit the empty net in the dying seconds of regulation to give him 23 goals on the season for the West Division-leading Greyhounds. The Brighton, Mich. native extends his point streak to eight games, giving him 32 points (23-9–32) over 29 games this season. 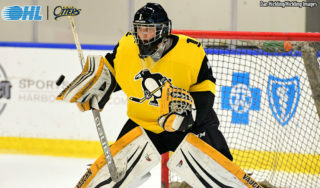 He attended rookie camp with the Arizona Coyotes this past September. 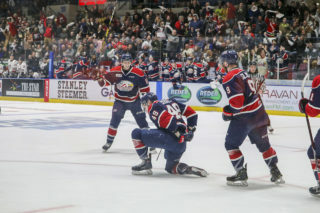 After scoring a hat-trick on Friday, Edmonton Oilers prospect Kirill Maksimov followed up with another two goals Sunday afternoon in Hamilton as the Niagara IceDogs took a 5-1 win. 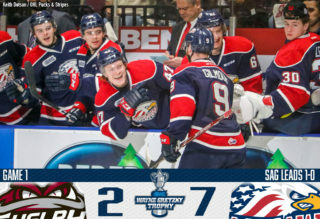 Maksimov opened and closed the scoring to bring his season total to 18 goals along with 14 assists for 32 points over 24 games. The 19-year-old has points in five of his last six games as the IceDogs sit tied for first in the Central Division. Maksimov was Edmonton’s fifth round pick in 2017 and recently represented Russia in the CIBC Canada Russia Series.